Josh Hammond & Jerel Culliss, Senior Security Consultants at IOActive, Inc.
With the connected car becoming commonplace in the market, vehicle cybersecurity continues to grow more important every year. 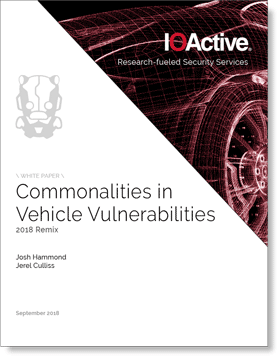 At the forefront of security research, IOActive has amassed real-world vulnerability data illustrating the general issues and potential solutions to the cybersecurity threats today’s vehicles face. ©2019 IOActive Inc. All Rights Reserved.